As humans, we tend to believe that events and processes will unfold in the way we expect them to. Unfortunately things rarely go according to our expectations and we end up being, well… surprised! But it isn’t just individuals, entire organisations can be caught unawares by events. In this post I draw on a paper entitled, Clues, Cues and Complexity: Unpacking the Concept of Organisational Surprise, to elaborate on the different ways in which surprises can crop up in organisational settings and in particular, in projects. My focus is on the latter because the temporary and one-off nature of projects seems to render them particularly prone to surprises. The authors define organizational surprise as, “any event that happens unexpectedly or any expected event that takes an unexpected shape.” One does not have to look far to see examples of organizational surprises. It is almost certain that any experienced project manager would have encountered a number of surprises in the course of his or her professional work. These could be unforeseen events (such as a project sponsor leaving for greener pastures) or unexpected twists and turns in what ought to have been a straightforward process (such as a software upgrade turning out to be more complicated than expected). The ubiquity of organizational surprises begs the question as to why we are still “surprised by surprises.” The short answer is that this happens because we tend to overestimate our ability to control the future. The authors suggest that we would be better served by regarding surprise as an inherent property of all open systems (which includes entities such as organisations and projects). After living through the consequences of many over-optimistic managerial actions (both, my own and those of others), I would have to agree. Nothing I have said so far would be surprising to readers: indeed, project management is largely about managing uncertainty…and all project managers know that. What might be new, however, is a classification of surprises proposed by the authors of the paper. I have hinted at the classification in the previous section where I gave one example each of a surprising event and a surprising process. It is now time to generalize this to a typology of surprises. When something that usually happens does not happen. It is important to note that although the term issue has negative connotations in project management parlance, it is used here in a neutral sense – i.e. issues can be either positive or negative. Process – a process is a chain of related events that unfolds in an unusual manner. For example, when an ATM cash withdrawal fails because the machine does not have enough money left to process the withdrawal. From the perspective of surprise, issues and processes can be either expected or unexpected. This gives us the four categories illustrated in Fig 1. Expected issue and process: This is the zone of predictability where one-off events tend to go as foreseen. An example of an expected issue that was successfully dealt with through planning was the Y2K problem. Another example is provided by (successful) risk management activities that are triggered when a foreseen risk eventuates. Unexpected issue, expected process: This is where a surprising issue occurs, but the consequences follow are expected. An example this would be a chance occurrence (say, a project team member on a troubled project stumbles on a novel technique that saves development time), and this leads to the project being completed within time and budget (expected process following the event). Expected issue, unexpected process: This occurs when an expected event evolves in an unexpected way – i.e. leads to a surprising process. A common example of this in a project environment is when a front-end project decision unfolds in unexpected ways. Another common example is an organizational change that has unintended consequences. Unexpected issue, unexpected process: This is a situation where both the event and the processes around it are counter to conventional wisdom. In this case, those involved need to understand, or make sense of the situation and hence the term sensemaking crisis. An example of this is when project managers fail to anticipate factors that turn out to have a major influence on the way their projects evolve. One could argue that many high profile project failures were the result of such crises. The Denver Baggage Handling System and the Merck Vioxx affair are good examples. In both cases, the projects failed because those responsible failed to react to certain events that changed the trajectory of the projects irrevocably. Let’s now take a brief look at the usefulness of this classification. 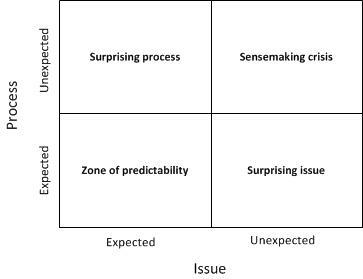 Managers expend a great deal of effort in attempting to predict surprises and hence corral them into the zone of predictability (Reminder: this is the bottom left quadrant in Figure 1). As mentioned earlier, this is difficult because organisations are open systems, and novelty is an inherent property of such systems. The main implication of this is that surprises in quadrants other than the zone of predictability cannot be foreseen. So, instead of worrying about predicting surprises, project and program managers would do better by focusing their efforts on creating an environment that enables team members to cope with nasty surprises and take advantage of good ones. What might such an environment look like? This question is best approached via a related question: what are the qualities displayed by project teams that are able to cope with surprises? Vigilance / problem sensing– a deep awareness of the project environment, with the ability to sense any changes in it. Resilience – the capacity to adjust to changes in the internal and external environment. The striking thing about these qualities is that they are impossible to create or engender by management fiat: teams will not improvise unless they feel empowered to, nor will they be resilient or vigilant unless they are intrinsically motivated to be so.These characteristics are emergent in the sense that they will be displayed spontaneously by teams that are in a frame of mind that comes out of being in the right environment. The primary task of a project manager, or any manager for that matter, is to create such a holding environment that provides psychological safety to the team and encourages rational (or open) dialogue between all project stakeholders (yes, including project sponsors). I won’t elaborate on these terms here since they are dealt with at length in the articles that I have provided links to in the previous sentence. Surprising events and surprising processes are best dealt with by the people who are at the coalface of the problem since they are intimately familiar with the context and history of the problem. Sensemaking crises are best handled by collaborative problem solving approaches such as Dialogue Mapping. The above yet again underscores the importance of the creating the right environment, for although predictable surprises can be tackled through traditional approaches to project management, those that lie in the other three quadrants cannot. A fact of organizational life is that project managers are often caught unawares by unforeseen events and their dynamics. In this post, I have summarized a typology of organizational surprises and have elaborated on its relevance to project management. I have also briefly discussed the ways in which different types of surprises can be tackled, emphasising that the key to tackling surprise lies in creating an environment that provides psychological safety and encourages open dialogue. Enterprise IT systems that are built or customised according to specifications sometimes fail because of lack of adoption by end-users. Typically this is treated as a problem of managing change, and is dealt with in the standard way: by involving key stakeholders in system design, keeping them informed of progress, generating and maintaining enthusiasm for the new system and, most important, spending enough time and effort in comprehensive training programmes. Yet these efforts are sometimes in vain and the question, quite naturally, is: “Why?” In this post I offer an answer, drawing on a paper by Brian Pentland and Martha Feldman entitled, Designing Routines: On the Folly of Designing Artifacts While Hoping for Patterns of Action. From a functional point of view, enterprise software embodies organisational routines – i.e. sequences of actions that have well-defined objectives, and are typically performed by business users in specific contexts. Pentland and Feldman argue that although enterprise IT systems tend to treat organisational routines as well defined processes (i.e. as objects), it is far from obvious that they are so. Indeed, the failure of business process “design” or “redesign” initiatives can often be traced back to a fundamental misunderstanding of what organisational routines are. This is a point that many system architects, designers and even managers / executives would do well to understand. … the frequent disconnect between [system or design] goals and results arises, at least in part, because people design artifacts when they want patterns of action…we believe that designing things while hoping for patterns of action is a mistake. The problem begins with a failure to understand the nature of organizational routines, which are the foundation of any work process that involves coordination among multiple actors… even today, organizational routines are widely misunderstood as rigid, mundane, mindless, and explicitly stored somewhere. With these mistaken assumptions as a starting point, designing new work routines would seem to be a simple matter of creating new checklists, rules, procedures, and software. Once in place, these material artifacts will determine patterns of action: software will be used, checklists will get checked, and rules will be followed. The fundamental misunderstanding is that design artifacts, checklists, and rules and procedures encoded in software are mistaken for the routine instead of being seen for what they are: idealised representations of the routine. Many software projects fail because designers do not understand this. The authors describe a case study that highlights this point and then draw some general inferences from it. I describe the case study in the next section and then look into what can be learnt from it. The case study deals with a packaged software implementation at a university. The university had two outreach programs that were quite similar, but were administered independently by two different departments using separate IT systems. Changes in the university IT infrastructure meant that one of the departments would lose the mainframe that hosted their system. An evaluation was performed, and the general consensus was that it would be best for the department losing the mainframe to start using the system that the other department was using. However, this was not feasible because the system used by the other department was licensed only for a single user. It was therefore decided to upgrade to a groupware version of the product. Since the proposed system was intended to integrate the outreach-related work of the two departments, this also presented an opportunity to integrate some of the work processes of the two departments. A project team was set-up, drawing on expertise from both departments. Requirements were gathered and a design was prepared based on the requirements. The system was customised and tested as per the design, and data from the two departments was imported from the old systems into the new one. Further, the project team knew the importance of support and training: additional support was organised as were training sessions for all users. As the launch date grew nearer, obstacles emerged. The implementation met resistance and stalled. After dragging their feet for weeks, [the department losing the mainframe] eventually moved their data from the mainframe to a stand-alone PC and avoided [the new system] entirely. The [other department] eventually moved over [to the new system], but used only a subset of the features. Neither group utilized any of the functionality for accounting or reporting, relying instead on their familiar routines (using standalone spreadsheets) for these parts of the work. The carefully designed vision of unified accounting and reporting did not materialize. People in the department that was losing the mainframe worked around the new system by migrating their data to a standalone PC and using that to run their own system. People in the other department did migrate to the new system, but used only a small subset of its features. All things considered, the project was a failure. The authors emphasise that the software was more than capable of meeting the needs of both departments, so technical or even functional failure can be ruled out as a reason for non-adoption. On speaking with users, they found that the main objections to the system had to with the work patterns that were imposed by it. Specifically, people objected to having to give up control over their work practices and their identities (as members of specific) departments. There was a yawning gap between the technical design of the system and the work processes as they were understood and carried out by people in the two departments. The important thing to note here is that people found ways to work around the system despite the fact that the system actually worked as per the requirements. The system failed despite being a technical success. This is a point that those who subscribe to the mainstream school of enterprise system design and architecture would do well to take note of. The authors go further: to understand resistance to change, they invoke the notion of dead and live routines. Dead routines are those that have been represented in technical artifacts such as documentation, flowcharts, software etc. whereas live routines are those that are actually executed by people. The point is, live routines are literally living objects – they evolve in idiosyncratic ways because people inevitably tweak them, sometimes even without being conscious that they are making changes. As a consequence live routines often generate new patterns of action. The crux of the problem is that software is capable of representing dead routines, not live ones. Routines are composed of people’s understandings of the routines (the authors call this the ostensive aspect) and the way in which they are actually performed or carried out (the authors call this the performative aspect). The two aspects, the routine as understood and the routine as performed, complement each other: new actions will modify one’s understanding of a routine, and the new understanding in turn modifies future actions. Now, the interesting thing is that no artifact can represent all aspects of a routine – something is always left out. Even though certain artifacts such as written procedures may be intended to change both the ostensive and performative aspects of a routine (as they usually are), there is no guarantee that they will actually influence behaviour. Managers who encounter resistance to change will have had first-hand experience of this: it is near impossible to force change upon a group that does not want it. This leads us to another set of complementary aspects of routines. On the one hand, technology puts in place structures that enable certain actions while constraining others – this is the standard technological or material view of processes as represented in systems. In contrast, according to the social or agency view, people are free to use technology in whatever way they like and sometimes even not use it at all. In the case study, the former view was the one that designers took whereas users focused on the latter one. The main point to take away from the foregoing discussion is that designers/ engineers and users often have very different perspectives on processes. Software that is based on a designer/engineer perspective alone will invariably end up causing problems for end users. Those responsible for the implementation of the system described in the case study followed the steps faithfully, yet the system failed because one department didn’t use it at all and the other used it selectively. The foregoing discussion tells us that the problem arises from confusing artifacts with actions, or as I like to put it, routines with reality. This failure to understand the difference between artifacts and actions is not new…the failure to distinguish the social (or human) from the technical is a “category mistake.” Mistakenly treating people like machines (rule-following automata) results in a wide range of undesirable, but not entirely surprising, outcomes. This category difference has been amply demonstrated for individuals, but it applies equally (if not more so) to organizational routines. This is because members’ embodied and cognitive understandings are often diverse, multiple, and conflicting. The failure to understand the difference between routines and reality is not new, but it appears that the message is yet to get through: organisations continue to implement (new routines via) enterprise systems without putting in the effort to understand ground-level reality. The sales rep calls on the customer. The customer orders a product. The important thing to note is that the functional event does not specify how the process is carried out – that can be done in a myriad different ways. For example, the sales rep may meet the customer face-to-face or she may just make a phone call. The event only specifies the basic intent of the action, not the detail of how it is to be carried out. This leaves open the possibility for improvisation if the situation calls for it. More importantly it places the responsibility for making that decision on the person responsible for the carrying out the action (in the case of a human actant). Then it is useful to classify a functional event based on the type of actants participating in the event – human or (non-human) artifact. There are four possibilities as shown in Figure 1. 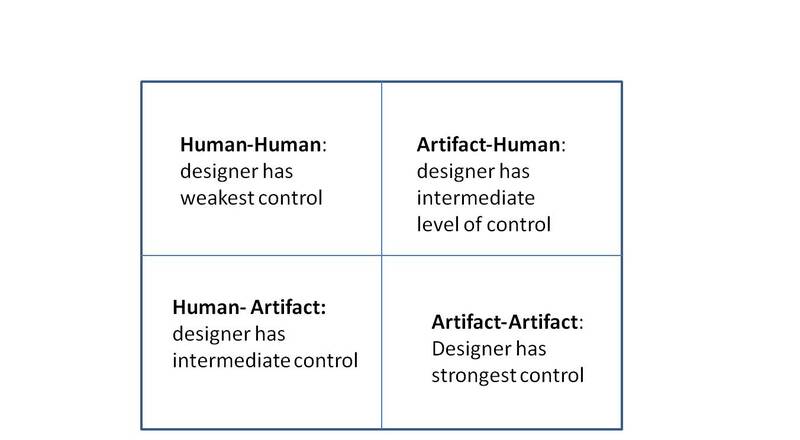 The interesting thing to note is that from the perspective of system design, an artifact-artifact event is one over which the designer has the strongest control (actions involving only artifacts can be automated) whereas a designer’s influence is the weakest in human-human events (humans rarely, if ever, do exactly as they are told!). Decomposing a routine in this way can thus serve to focus designer efforts in areas where they are likely to pay off and, more importantly, help them understand where they are likely to get some push back. Reinforce the patterns of the routine: Much as practise makes an orchestra perform better, organisations have to invest in practicing the routines. Practice connects the abstract routine to the performed one. Consider every stakeholder group’s point of view: This is a point I have elaborated at length in my posts on dialogue mapping so I’ll say no more about it here. Understand the relationship between abstract patterns and actual performances: This involves understanding whether there are different ways to achieve the same goal. Also consider whether it is important to enforce a specific set of actions leading up to the goal, or whether the actions matter less than the goal. Encourage people to follow patterns of action that are important: This involves creating incentives to encourage people to carry out certain important actions in specified ways. It is not enough to design and implement a particular pattern within a routine. One has to make it worthwhile for people to follow it. Make it possible for users to become designers: Most routines involve decisions points where actors have to choose between alternate, but fixed, courses of action. At such points human actors have little room to improvise. Instead, it may be more fruitful to replace decision points with design points, where actors improvise their actions. Lock in actions that matter: Notwithstanding the previous point, there are certain actions that absolutely must be executed as designed. It is as important to ensure that these are executed as they should be as it is to allow people to improvise in other situations. Keepan open mind and invite engagement: Perhaps the most important point is to continually engage with people who work the routine and to be open to their input as to what’s working and what isn’t. Most of the above points are not new; I’d even go so far as to say they are obvious. Nevertheless they are worth restating because they are often unheeded. A paradox of enterprise systems is that they can fail even if built according to specification. When this happens it is usually because designers fail to appreciate the flexibility of the business process(es) in question. As the authors state, “…even today, organizational routines are widely misunderstood as rigid, mundane, mindless, and explicitly stored somewhere.” This is particularly true for processes that involve humans. As the authors put it, when automating processes that involve humans it is a mistake to design software artefacts while hoping for (fixed) patterns of action. The tragedy is that this is exactly how enterprise systems are often designed.